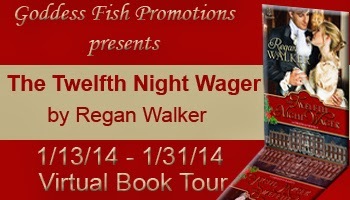 The Twelfth Night Wager, my newest Christmas novella, was not the first holiday themed Romance I have written. In 2012, I wrote The Holly & The Thistle, and in early 2013, I wrote The Shamrock & The Rose (a Valentine’s Day story). All are set in 1818 in Regency England. The important thing when setting a story in a holiday period is to capture the traditions of that special time, be it Valentine’s Day or Christmastide or Twelfth Night, without taking the romance from center stage. You want the reader to experience the love story and love the characters while also experiencing the holiday. And, if you are a Regency author like me, you also have to capture the history of the period and enough of the speech and customs to make it real. So when Lord Eustace is invited to a house party in November of 1818, I had to know that he’d expect to be shooting pheasant and riding to hounds (fox hunting) in the countryside. I also had to know what flowers would be blooming in the gardens of Wimpole Hall (an actual estate in Cambridgeshire). When I describe a place I always have a visual in front of me. In Regency England, they celebrated the seasons a bit differently. For example, the ornate Valentines we think of today are more from the Victorian period. They were more simple love notes in the Regency. And at Christmastide, they did not put up Christmas trees (that, too, came with the Victorians though Queen Charlotte, the Prince Regent’s mother did recognize the German tradition). The folks in Regency England decorated their homes with Christmas greenery beginning on Christmas Eve and took them down on Epiphany (the day after Twelfth Night) when the greens would be burned in the fireplace. Also, it is important in a holiday Romance to capture the sights, sounds and smells of the season. When my characters walked into the parlour in my two Christmas stories, I wanted them to hear the crackling fire, smell the wassail’s aromatic and spicy fragrance and see the red velvet bows on the candle lighted chandelier. And, I want the reader’s mouth to water when I’m describing the Christmas feast. (One reader told me I sent her to the kitchen looking for something to eat she got so hungry reading my story). I put recipes on my website from my stories for my readers to cook them at home. Eustace slowed the horses and guided the phaeton to the side of the path. Holding the reins in one hand, he turned to face to her. His eyes seemed to glow in the dim light. Grace wondered if he was still speaking of horses or something else. Her heart sped as he leaned toward her and brushed his lips across hers. After only a moment, she pulled back. As a child Regan Walker loved to write stories, particularly about adventure-loving girls, but by the time she got to college more serious pursuits took priority. One of her professors thought her suited to the profession of law, and Regan realized it would be better to be a hammer than a nail. Years of serving clients in private practice and several stints in high levels of government gave her a love of international travel and a feel for the demands of the “Crown” on its subjects. Hence her romance novels often involve a demanding Prince Regent who thinks of his subjects as his private talent pool. Regan will be awarding a copy of three (3) of her books, Racing with the Wind, The Holly and the Thistle and The Shamrock and the Rose to one randomly drawn commenter during the tour. Hi, Krystal! So good to be on your blog. I was wondering, though, did GF not send you the images? One of the things I enjoy most about historicals is "seeing" the rooms, outfits, and customs of that period. Thanks so much for sharing your talent with us. I know your past service in law was important but I am so glad we are all able to read your wonderful stories. Historical romance is one of my favorite genre and I appreciate the chance to win some great books. I always love holiday themed stories. I loved reading the author's information on how holidays were celebrated in the past. Thanks for the great information and giveaway! Three books, very generous giveaway, thanks. I really enjoy Historical Romances. My grandfather was raised in England. He is from disinherited Royalty. I was raised with wonderful stories of my English heritage.